Virginia’s power mix is making the clean energy shift, and it has significant opportunities for progress in improving its energy efficiency. This analysis comes from a new report from the Business Council for Sustainable Energy (BCSE), a coalition of clean energy companies that promotes the adoption of market-ready clean and sustainable energy products and services, and Bloomberg New Energy Finance. Compared to the rest of the country, the Commonwealth’s carbon emissions are lower than the national average and it has lower than average power prices. The Virginia Clean Energy Factsheet shows that Virginia is making positive steps towards a diversified energy portfolio. Overall, the Factsheet finds that last year Virginia ranked 10th in total electricity consumption, and 17th in electricity generation. This makes Virginia one of the nation’s biggest electricity importers. Natural gas provided a record 39% of electricity in 2015, while renewables grew to 5.3%. The remaining generation comes from nuclear (33%) and coal (21%). 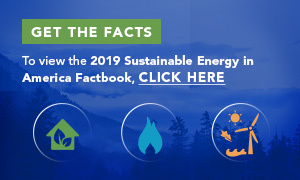 The Factsheet contains more data and analysis on the energy efficiency, renewable energy, and natural gas sectors in Virginia – providing a succinct look at Virginia’s power sector as it diversifies and moves to a lower carbon energy mix. It also highlights that there are significant opportunities for energy savings to be realized through energy efficiency measures and programs. The right energy efficiency programs can reduce energy costs for consumers, benefit the economy, and reduce emissions. They can also help make Virginia more energy independent. Nationwide, energy efficiency programs and services implemented over the past several decades have contributed significantly to the increased energy productivity of the U.S. economy. According to BCSE’s 2016 Sustainable Energy in America Factbook, energy efficiency has led to the decoupling of GDP and energy consumption; between 2007 and 2015, GDP went up 10%, while energy consumption actually went down by 2.4%. This means that every unit of GDP requires less and less energy spending to produce. National spending on these energy efficiency programs grew 25% per year from 2006 to 2011, reflecting the growing acknowledgement of its economic and energy benefits. Despite this surge in national spending on energy efficiency, Virginia has not been as quick to make similar investments. Virginia ranks 31st according to ACEEE’s energy efficiency scoring system, and ranks last among states in utility spending on energy efficiency as a percentage of revenue. In 2014, Virginia spent just .01% of electricity revenues on energy efficiency programs, while Maryland and New Jersey (states that also operate in the PJM market) spend 4.3% and 2.0%, respectively. Investments in energy efficiency products and services have demonstrable benefits to consumers. From 2010 to 2015, as national spending increased, consumers actually saw reductions in their electricity use and bills. The Factbook shows that the average U.S. residential customer used 6.2% less electricity, despite owning more gadgets, and paid about $80 less in real dollars on their electricity bills annually. In Virginia, the Factsheet shows the energy savings potential is a cumulative 23% by 2030. That means avoiding 25TWh of generation in 2030. Given these benefits, as the Governor’s Executive Order 57 Working Group on emissions reduction continues to seek ways to reduce the Commonwealth’s carbon footprint, energy efficiency should be prioritized. It is a cost effective way to cut back on emissions that also saves money for consumers. Other policy makers are well positioned to take action on energy efficiency. The General Assembly took an important step towards advancing energy efficiency in the Commonwealth by mandating that the State Corporation Commission evaluate the establishment of uniform protocols for measuring verifying, validating, and reporting on the impacts of utility energy efficiency programs. Establishing a robust system for evaluation, measurement, and verification (EM&V) will be crucial to the success of energy efficiency programs. BCSE has recommended that the SCC consider the many well established resources available on EM&V as it makes decisions about how Virginia will move forward with EM&V protocols. The Commonwealth is in a good position to deepen its commitment to an economic growth pathway that further embraces a diverse portfolio of clean energy resources. Energy efficiency is a key component of that portfolio, and one through which Virginia stands to gain significant economic and energy saving benefits. For more information and to download a free copy of the Virginia Factsheet and Sustainable Energy Factbook please visit bcse.org/sustainableenergyfactbook.